You may come across many articles on the internet telling you several ways to clean up a granite countertop. However, it is very important that you understand the cleaning process in a right manner, before you start to clean your kitchen countertops with the ways suggested on the internet. You need to be very careful when it comes to cleaning granite. They are really expensive to buy and install and you have to make sure that you maintain them in perfect manner to keep them looking like new for years to come. Here in this article, we are going to tell you the names of some chemicals from which you have to stay away while cleaning the granite countertops. Many sites on the internet may suggest you the name of the ammonia to clean the surface of the granite. Though ammonia is the most used product, when it comes to cleaning windows, as it prevents streaks and removes the oil stain marks. But if you are going to use the ammonia to clean the granite, then it will strip away the sealing off the surface and it will leave the granite vulnerable to scratches and stains. Most of the home owners are in a habit to use bleach for the purpose of kitchen cleaning. However, cleaning the top of the granite with bleach is not at all a good idea, as it is harmful for the sealing of the granite. Once the sealing will be off, the granite will be subjected to stains and they are very tough to clean. You should also avoid using the products that has bleach in them. Abrasive cleaners are a very bad option to clean the surface of granite. These products are used to clean pans and are really affective for scouting. However, if you are going to use them on granite, then they will peel the sealing off the surface and will cause them to wear really fast. Always ask the professional before you get any new product to clean the surface of the granite. If you have used the abrasive cleaner to clean the granite, then it is highly recommended that you call in the professional and get the granite resealed. As vinegar is an excellent option to remove oil and streak marks, many people use it to clean the countertops. But you cannot use it to clean the granite countertop. Like every other chemicals that we have already discussed, vinegar too will cause damage to the sealing of the granite. As vinegar is of acidic nature, you must avoid the use of any cleaning material that has vinegar in it. If you have any doubt regarding the cleaning of the granite countertop, then it is always best to call in the professionals and take ideas for them about the cleaning. 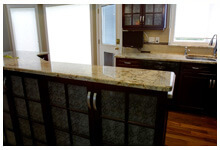 You can also get your granite cleaned from the professional granite installation companies as they also guide you with the maintenance of the granite countertop.